Today, I have a pair of fun gift ideas using last month's sets Cup of Wishes and No Peeking! Over the several years, I've been trying to be more thoughtful and less wasteful in my holiday gifting. "Things" have been replaced by "experiences" like tickets to shows, season passes for amusement parks, and lots and lots of homemade food and hot beverages:) So today I have a teabag holder and hot chocolate on a stick (more on that later:) gift wrap. I embossed the teacups in gold to mimic lovely vintage china. Then I colored the flowers with my copics. The teabag holder on the left holds 5 teabags. For the wrap on the right, I made the "hot chocolate on a stick" with this recipe. BTW, I've heard that you can eat the "hot chocolate on a stick" like fudge. Not that I would know firsthand, lol! Thanks so much for popping in! If you're working your way through today's blog hop from the beginning, you should have arrived from Pearl Lui's blog! The next stop on this stampede is Lexi Bridges! If you've just jumped into this stampede, don't worry! Just start at the Mama Elephant blog and you won't miss a thing! While you're hopping, don't forget to leave a comment for a chance to win a GC for the Mama Elephant site! The winner will be announced on the ME blog on December 5th! two lovely gift ideas. 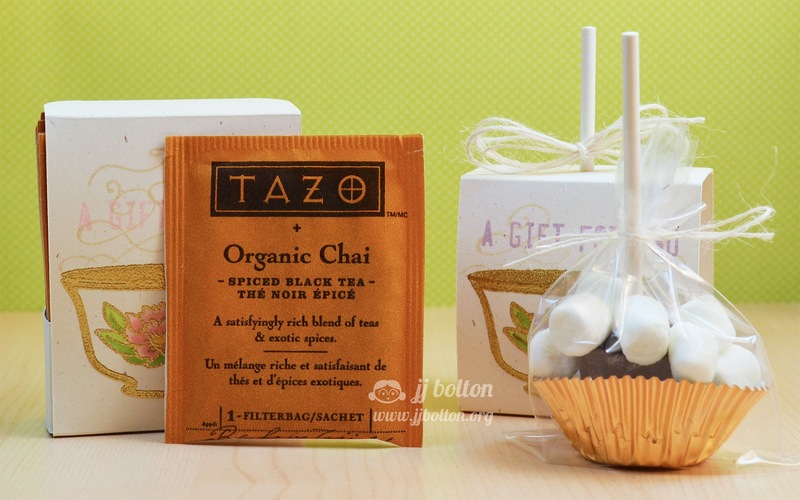 I'm always on the lookout for teabag holders and the hot chocolate stick one is fantastic. Very pretty gift set! I love it! Thanks for sharing your ideas and resources!!!! So Fun...Perfect Little Creative Gift!!! What great gift ideas. Love the gold embossing and thanks for the link to the recipe. gorgeous gift set. love the gold embossing. How gorgeous!! I love the gold - it looks like a porcelain cup! Fantastic gift sets! Love the gold embossing and coloring of the teacups! 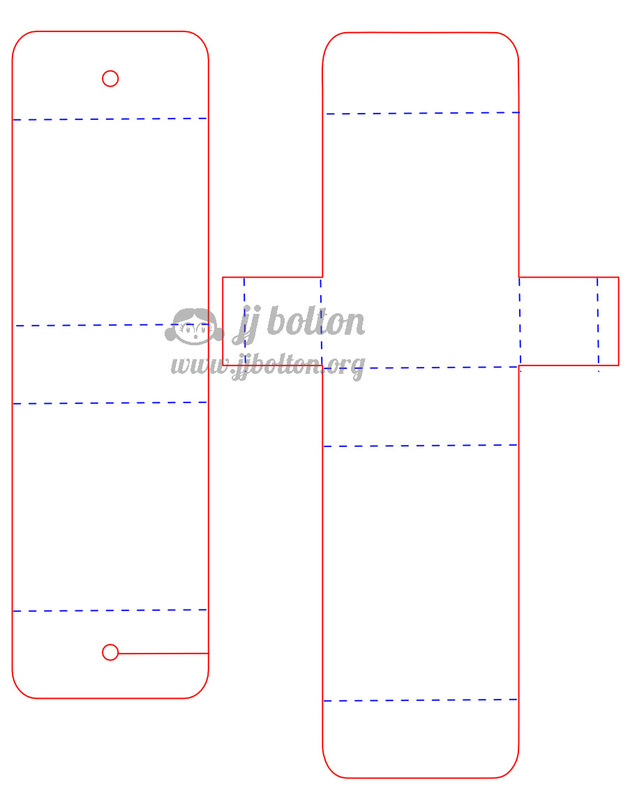 Thanks for sharing the templates, too! Well you've certainly succeeded in giving useful and lovely gifts. The are stunning. 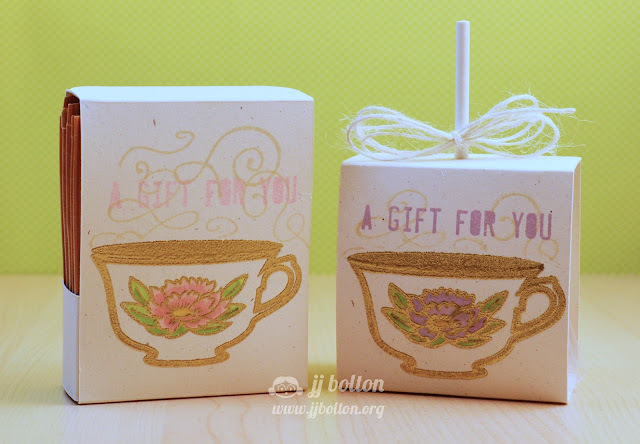 Love the sweet little tea packet box! TFS! These are so pretty! What a delicate design! Great gift giving idea! Thanks for the file too! What a very thoughtful gift...so pretty with the gold embossing. Love the gold embossing. Makes it look so regal. TFS. Awesome idea, Thank you for the pattern...I love tea. I refuse to go look at the hot chocolate on a stick recipe. Not gonna do it. Love these for gift ideas - and I love your idea of giving experiences. Beautiful :) Love the embossing - and I feel your juicy pain, lol! I'm with Jessie - avoiding that recipe for the sake of my hips! 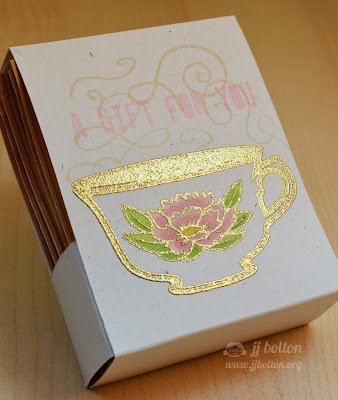 Love your gorgeous tea cups - the gold embossing powder is awesome! And I like your gift giving philosophy - less waste, more thought. As it should be! Both projects are wonderful!!!!!! love that they would make fabulous little gifties and girl, you rock for sharing the files!!! Wow! Some lucky recipients! They get two gifts in one adorable package! You are always so sweet to share your files : ) Love giving experiences vs. boxes. These turned out really well! Oh my but these are SUCH lovely projects! I know I would love to receive such a thoughtful handmade gift. And the teacup is PERFECT! And hot chocolate on a stick ... now there's a novel idea! My grandkids would LOVE it! what cute little gifts! Love it! What a cute and pretty ensemble. I have a silhouette on my Christmas list. Yeah. These are great gift ideas. They would make great hostess gifts. thanks for sharing. 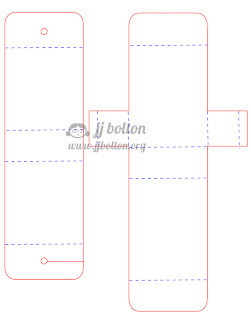 You, JJ, are making me want a digital cutter!!! This is a sweet little gift!!! What a great set, JJ! The gold embossing makes these tea cups so elegant - such a beautiful way to give a little gift.